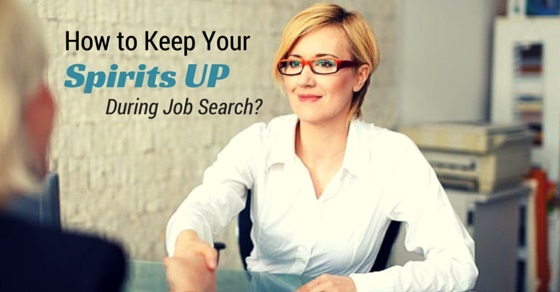 How to Keep Your Spirits Up During a Job Search? Job search can be quite demanding. In today’s circumstances, when economy is not on a great pitch and unemployment rates are quite high, job search period can even last up to a year or more. It is natural if your spirit goes on a dive during this period and it is even all right to be a little disappointed, for a short time. But you will have to bounce back and keep your spirits high, because you need positive attitude, high energy, great spirits and high morale to survive during the tumultuous job search period and come out with flying colours. Mind is indeed a powerful tool. How it works decides how our life will be. During job search, there can be moments of despair. Notes of rejection can be depressing sometimes. It is during such phases that you need to keep away negative thoughts and embrace positive thinking. You need to make it a practice. Keep away negative people and media, wake up with a positive attitude, be confident about you, every morning remind yourself that you are talented and efficient and end the day by focusing only on the positives. Make this routine a habit and you will turn into a positive person for the rest of your life, not just during job search. An easy way to do this is to stick a positive or motivational quote on the wall opposite your bed, so that once you wake up, you read that quote that inspires you. You can even stick motivational sayings or pictures on the refrigerator, doors or walls. These little acts will help as a motivational factor and help you keep your spirits high when going is hard. You tend to become a couch potato when there are hard times. And job search can be such a time. The only way to prevent the situation is to be active. Hit the gym, go for walks, de-clutter your mind and thoughts, inhale fresh air and positive energy and be fit, so that you are ready to crack that interview in flying colours. You are ‘working hard’ during job search, so why not treat yourself? Go for shopping, buy a new dress or shoes for the interview which can happen soon. Play music, sing a song, do a little jig, hang out with friends, basically, do things that makes you happy. When you are genuinely happy, you tend to think and hope about good things and you even get those things. This is not the time to meet people who will depress you further. Surround yourself with highly energized people who believe in you and who will support you through the period. Meet up with genuine and true friends and family members. Go out and spread your network, meet new people. Make friends but stick on to those who are positive and you are happy to be with. Being with high spirited people helps you to be in great spirits yourself. Knowledge is a great way to keep your sprits high. So what, if you are currently not on a job? Read industry reports, find what’s new in the field, know about all trends, sales, mergers or happenings in the industry. Also, update your skills, that might help you in your job. Learn a new computer skill, or a new language, or take a course that is relevant to your field. Updating yourself will automatically make your spirits soar. There is a positive side to everything and it depends on how you look at it. It is called optimism. You may not have a job now but what’s the big deal? Look at the positive side. You also have so much time for yourself. You can read those books that are lying in your shelf for months now. You have time to rearrange or redesign your home. You can join a course. You have lot of time for exercising and you can get into that size you long wanted. See? There are so many positives. Go ahead, enjoy the moment, but at the same time, keep your job search on. Do everything that will help you find a new job, be it rewriting your resume, writing a better and more practical cover letter and sending it all around, to as many people as it could reach. Read about interview skills and practice interview questions. Keep copies of your resume and certificates ready. Keep your interview clothes ironed and ready. Find more recruiters and send them your resume. Ask ex colleagues or friends or family about job openings and send resumes everywhere. Talk to people, meet recruiting officers rather than just mailing or talking to them on the phone. Remember, the more work you put, better are your chances of landing that exclusive job. The best way to keep your spirits high during job search is to forget about the interview you have just attended and move on. Sometimes, a rejection or a remark at an interview can cause depression and in some cases, the candidate in question, may not have the courage to go for another interview fearing same response. You have already attended that interview, all right, forget about its outcome and attend more. One of them will turn in your favour for sure. Anxiety levels increase when there is just one chance and you will ruin it yourself with your imaginary fears. When there are multiple options, you feel more confident. Look around, there are so many inspirational stories. Read about lives of great men and women and you will find that their early days were all about struggle and you will be relieved to know that many of them were on the verge of falling, some went bankrupt, some were rejected and mocked and so on. Imagine what would have happened if they would have given up? The best example is of Thomas Edison who is said to have 10,000 trials to make the electric bulb functional ! We all love Mickey Mouse and his friends and we can’t thank the creator Walt Disney enough but did you know, no one bothered much about Mickey Mouse when it was released first and Disney had to strive year after year to make it popular. You have no trouble compared to these people. Hence stick around and keep your spirits high. Just because you don’t have to wake up early to rush to your office, doesn’t mean you should sleep till afternoon. Get up early, go for a walk, get ready, clean your house, attend a class, make lunch and dinner, tidy up your place, listen to music, try some meditation, meet friends, and yes, amidst all these, keep your job search going. Just create a routine including all these and make it a habit. Manage your schedule professionally. Set up a weekly target of sending so many resumes or talking to so many people and so on. Reward yourself for the targets achieved and punish yourself if you have been slack. At the end, tracking your results helps. If your job search is stretching a bit, try for a part time job at a small firm or an NGO or do some freelance work. This will keep you occupied for some part of your day, you will have to dedicate yourself for your job search for the rest of your day. A freelance assignment or a part time job will help you enhance your confidence and will give you the energy to try harder and be in good spirits during job interviews. It will also give you something to add on to your resume, plus taking care of some of your bills, it not all. It helps if you consider job search like a job and stick to a discipline. It really doesn’t mean that you will only have to do that from morning till evening but while you keep yourself engrossed in all other activities, dedicate some hours to your job search. Sometimes, it is ok to feel dejected and sit quiet for some time, but remember, you are not alone in this job search, there are many who are trying. In fact, you may be the lucky one of them because of what you have right now. Keep going with positive thoughts in your mind and with energy to face each day with courage and confidence. At end of the day, job search is like any other activity in your life with the only difference being that this task is going to get in benefits, the benefit of a great job, perks, climbing up the ladder and of course, your salary check. The above tips will help you manoeuvre through and keep your spirits high, even when the road is bumpy. Keeping your spirits up during job search is very important because if you are not, you will be hard on yourself and you may tend to be cynical and diffident which can work against you. Hence, follow the 15 steps mentioned, make them a habit and tread through the job search positively and keep your head and spirits up!